The JacksonFuller Real Estate team has released Off-MLS Sales in 2013: Home Run or Foul Play?, a comparison of 2013 Off-MLS and MLS sales prices of San Francisco residential real estate. The document is free and available for immediate download. Off-MLS Sales in San Francisco: Fair Play or Foul Ball? 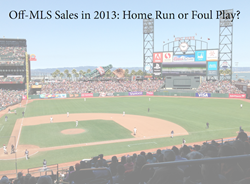 The JacksonFuller Real Estate team has released Off-MLS Sales in 2013: Home Run or Foul Play?, a comparison of 2013 Off-MLS and MLS sales prices of San Francisco residential real estate. The document is free and available for immediate download from their network of San Francisco real estate websites, including their San Francisco Real Estate blog, luxury condo homes in San Francisco, and New Construction Homes in San Francisco. Compares the number of Off-MLS sales in the high-end luxury market to the general market. Statistics are reported separately for single-family homes and condos, which allows buyers and sellers to focus on the property type that is most relevant to them. Is there any value to listing my home on the MLS? Should I allow my agent to sell my home as an Off-MLS listing? Is it common in San Francisco for homes to sell Off-MLS? Ongoing analysis and commentary about the Off-MLS Sales in 2013: Home Run or Foul Play? report will be available in the coming weeks and months on all three websites written and run by the JacksonFuller Real Estate team. Readers are always invited to join the conversation with Matt Fuller, GRI, and Britton Jackson, CRS, by posting questions, comments or observations. The JacksonFuller Real Estate team is composed of Britton Jackson, CRS, and Matt Fuller, GRI, who have more than 25+ years combined experience in San Francisco real estate. Matt and Britton transform their clients' goals into reality with their combination of market experience, win-win negotiation skills, high-tech savvy and a personal touch. They are proudly affiliated with Zephyr Real Estate, San Francisco's largest independent real estate brokerage. CA BRE license information: Matt Fuller, GRI, BRE #01342261 and Britton Jackson, CRS, BRE #01308661.